• Sports tape combines superior adhesion and tensile strength to provide support to joints under stress. • Under dressing for all taping techniques or for dressing retention. All-fi x will remain in place even when wet. It is a high quality nonwoven fabric with a hypoallergenic adhesive. • Elastic therapeutic tape, gives support and stability to joints and muscles without affecting circulation and range of motion. is applied over muscles to reduce pain and inflammation, relax overused tired muscles, and to support muscles in movement on a 24hr/day basis. It can also be used for preventive maintenance and to treat oedema. 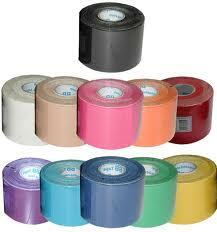 It is non-restrictive type of taping which allows for full range of motion.